”Development assistance projects need custom-tailored IT solutions. Clients worldwide trust GFA B.I.S because we specialize in software customization that verifiably increases projects’ transparency, efficiency and auditability while keeping total cost of ownership low”. In international cooperation, the availability of appropriate IT tools is of ever increasing importance. 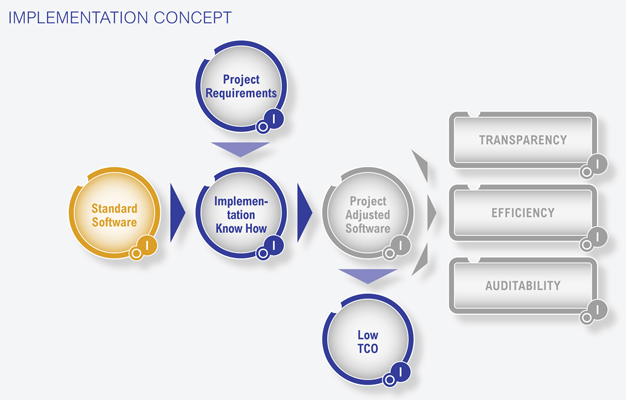 Professional software solutions contribute to enhanced efficiency and transparency of programs and projects. However, identifying the right approach is not easy because the market is flooded with products that are often neither professional nor adapted to clients’ particular needs and tight budgets. This is where GFA B.I.S. comes in. As a channel partner of INFOR, one of the leading business software providers, GFA B.I.S. excels in customizing professional standard software to clients’ needs. Where off-the-shelf software is not available at a reasonable price, Open Source IT solutions are developed to specification. In addition, GFA B.I.S. has extensive experience in IT consulting focused on the optimization of existing software systems. Over the past twelve years we realized over 90 IT projects worldwide including over 50 SunSystems Implementations. A team of experienced and dynamic managers and IT experts takes care of the GFA B.I.S. portfolio of projects funded by major official development assistance (ODA) agencies worldwide. In addition, the company offers resulting knowhow to private and public customers beyond ODA. Based on its deep understanding of international cooperation and profound IT knowledge, GFA B.I.S. is best suited for providing tailor-made solutions. The company takes pride in offering its clients fast and project-oriented customization and implementation while keeping total cost of ownership low. These services encompass extensive training, maintenance and support so that the tools introduced by GFA B.I.S. are of sustained benefit for customers and well accepted by users. By applying optimized remote assistance facilities via internet and email, support is effectively delivered across continents.